The ‘Hierarchy of Ideas’ is something you need to get your head round before you can really understand how NLP language patterns work. Luckily it’s easy to understand. The concept is to do with how abstract or specific your language is, which of course indicates where on the spectrum between overall ‘big picture’ and fine-grained detail your mind is focusing. This is also known in NLP as ‘chunking’, because our minds seem to process information in a small number of ‘chunks’, and people vary as to how detailed or big-picture the amount of information held in each ‘chunk’ is. It’s also sometimes known as ‘levels of abstraction’, because the higher up the Hierarchy of Ideas you go, the more abstract the concepts you are dealing with. This will become clear in a moment when we look at an example. Being aware of the Hierarchy of Ideas is important, because the more flexibly you can move up and down the levels of abstraction, the more successful you will tend to be in work terms, and the more skilled you will be at dealing with people who are stuck at one end or the other of the detail/big picture spectrum. As an executive coach, I’ve found that one of the main reasons that stop people from being promoted to director level is not being able to think strategically – in other words, they haven’t been comfortable thinking at an abstract level, which is what top-level leaders are required to do. The higher up the organisation you are operating, the more you have to think in terms of the big picture. From time to time, you may have had to work with someone who is a real nitpicker. If you ask this person to do something, they need you to tell them exactly how to do it, down to the finest detail; or maybe they go and do it, and then they come back and tell you the entire story, step by step, of how they did it. If you ask this person how their weekend was, they’ll tell you in excruciating detail and chronological order each thing they did. And if you interrupt them, they feel they have to start the whole narrative again from the beginning! Alternatively, you may also have worked with someone who only thinks in big-picture terms, and is bored by details. They only want to know the overview, or what’s important, and they will do their best to avoid practicalities. They’ll give you vague instructions, and if you ask them about how you want them to do what they’re asking, it’s a real struggle to get them to come down to some kind of practical level. What you have there is two people at opposite ends of the NLP metaprogram called Chunk Size, or General/Specific. If you’re detail-oriented yourself, you’ll be asking at this point ‘What’s an NLP metaprogram?’ If you’re more at the big picture end of the spectrum, you’ll be confident that you’ll be able to pick up the meaning from the context. ‘Metaprograms’ in NLP are usually defined as something like ‘the content-free filters we use to sort information’. In practice, they are a number of patterns that describe what we focus our attention on. There were about 60 of them when Leslie Cameron Bandler and others originally identified them back in the early days of NLP, and usually nowadays most NLP trainers teach a more manageable 14 or so of the most useful ones. Metaprograms by the way are usually taught in depth at NLP ‘Master Practitioner’ level, but this one is worth mentioning here because it is very relevant in a business context, and also quite easy to get your head round. So, General/Specific, also called ‘Chunk Size’, is one of the most important metaprograms in NLP. The idea is that rather like a computer, our minds have a certain amount of working memory that we use to hold whatever we are thinking about at any given time. Space in our working memory is quite limited, so we are only able to process a small number of chunks of information at any given time. This is often rather inaccurately quoted as 7±2, following psychologist George Miller’s research in the 1950s, but more recent research, as well as everyday experience, suggests that in practice we have more like 3 or 4 chunks of information available in working memory. So how do we investigate something in more detail, or zoom out to see more of the bigger picture? We change the amount of information in the chunks. We can ‘chunk up’ to a bigger chunk size, or ‘chunk down’ to finer levels of detail. Let’s see how to do this in practice. 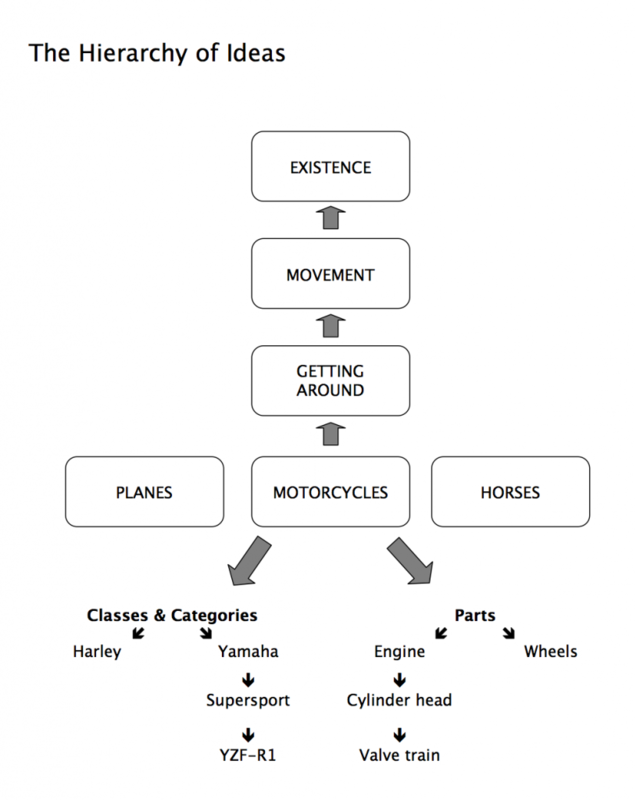 Have a look at this Hierarchy of Ideas diagram, with the box called ‘Motorcycles’. How many makes of bike can you name? Some people are not that interested in bikes, and just see them as something that other people have, and they can probably name Harley-Davidson and two or three others. A real bike fanatic, on the other hand, will know all the makes including defunct ones like Vincent and BSA, and would then be able to reel off all the names of different models from each manufacturer. So one way you can chunk down from a particular category or class (like motorbikes) is to ask ‘What are examples of this?’ Naming a specific make of bike is more detailed than the class of bikes in general, and going down to specific models within a make is a smaller chunk size still. Notice how the further down you chunk, and the finer level of detail you get into, the more scope for disagreement there is. Two people may both love bikes, but if you get them talking about their favourite bike and why it’s so great, then they’ll probably choose different models and have plenty to disagree about. Also notice how there are different ways of dividing bikes into classes. You could distinguish between different manufacturers, or you could divide them into dirt bikes, cruisers, racers and so on. Let’s look at chunking up to get to the big picture, or what’s really important. Questions you can use to chunk up from the category of ‘bikes’ are: “What’s this an example of?” Well, bikes are an example of a way of getting around. Incidentally, you will notice that there are other categories of transport at the same level of abstraction, like buses, planes, boats, or horses. So we can also chunk sideways to one of those other categories by first going up one level, to ‘ways of getting around’, and then asking “What’s another way of getting around?” We do this unconsciously all the time; going up one, two or even three levels and coming down in a different place is one way that we get new ideas, and get out of being stuck in problems. If you want to keep chunking up, just keep asking the question “What is this an example of?” So what is ‘getting around’ an example of? One answer might be Movement. And what is Movement an example of? Existence – which is pretty much as abstract as it gets. Other ways of chunking up are to ask “What is this part of?” or with actions “For what purpose?” or “What’s important about this?” which chunks up to the intention or value that’s driving the action. Now just as the more detailed you get, the easier it is to find things to disagree about, the easier it is to agree as you chunk up higher. Why? Because chunking up makes it easier for people to remember the broad principles that they are in agreement about, rather than getting lost in nitpicking details. So if you’re in a negotiation or chairing a meeting and it’s getting bogged down in disagreements about specifics, it’s useful to chunk up to a higher level and remind people of the purpose of the meeting, or what is important to both sides in the negotiation. Also, abstractions can mean different things to different people, because they don’t have specific sensory referents to point to (‘sensory referents’ are things in the real world that you can see, hear or touch). Sometimes this is OK, but at other times it can cause problems as you get down into practical implementation, as the different interpretations of what people thought they were agreeing to come to light. Everyone is probably in favour of better productivity, but does ‘productivity’ mean ‘the same people being able to produce more’, or ‘producing the same amount but with a smaller number of people required’? Here is one more important thing about the effect of abstraction. Because abstract concepts are vague, and not physical real-world things that you can form a sensory internal representation of, when you hear or read an abstraction-word (like quality, agreement, remuneration, morale or relationship) you have to go inside and form your own meaning of it, either by finding a metaphorical image that symbolises the abstract concept, or events that (for you) are examples of it. What internal representations do you form when you hear the word ‘love’? Or ‘personal development’? Probably each reader will have a different image, drawn from your own experience, or if you had no direct experience of the concept, what you imagine it to be like or what you have heard from other people. In effect, this puts you into a trance state; you’re paying attention to what’s going on inside your mind, rather than what’s going on around you. The first person to notice this effect was probably the great hypnotherapist Milton Erickson. Up until then, hypnosis had been about swinging watches and direct suggestions that you were getting sleepy. Erickson found that by talking to people ‘artfully vague’ language, with a lot of abstractions, he could get them to drift off into a trance state without using direct suggestions. This was very useful in his work, because it meant he could bypass any resistance his clients might have had to a more direct approach. Have you ever had to sit through a long speech, maybe at a meeting or a company get-together, where the speaker is using a lot of abstractions, and you have found yourself drifting off and thinking about something else? That’s exactly the same experience – except that unlike that speaker, Erickson knew what he was doing and was using the abstractions with intention, to aim your thoughts in directions that would benefit you. There is another benefit in using abstractions in helping people to change. When Erickson talked to people about their inner resources, or about certain learnings they had gained, without specifying what those resources and learnings were, it allowed their unconscious minds to select the resources and learnings that were right for them at that moment. So, as we said, a person will have a particular range of levels in the hierarchy of ideas that they feel at ease in. Some people will have quite a narrow band that they feel comfortable in – a person with a strong detail focus could feel overwhelmed by vagueness if you ask them to consider the higher levels of abstraction, while a person who only operates at big-picture level will get bored and frustrated at the detail level and think of it as nit-picking. If you think about hierarchical organisations like the armed forces, people at the bottom of that hierarchy are given very specific tasks – “theirs not to reason why”. As they rise through the ranks, each promotion involves handling higher and higher levels of abstraction, until at the level of the top generals and field marshals they are dealing with very high-level strategy. The higher the level of abstraction you can be comfortable with, the higher you can go in an organisation and the more you’ll be rewarded. Here’s another thing to consider. Higher levels of abstraction are more powerful than lower levels of detail, and give you more leverage, because the higher level includes the lower levels. If you have a motivating value that’s important to you such as achievement, for example, the many different things you could do to fulfil that value are at a lower, more specific, more concrete level. But they’re all included within that abstraction of achievement. That gives you an almost infinite number of choices for how to achieve that value. If one way is denied you, or it has downsides that make it not worth going for, you have choices about other ways to achieve that value. But someone bogged down at the more concrete level may be stuck with just one way of achieving the value. If that way is denied them, they won’t easily be able to change what they are doing to find another way of fulfilling the value. So if circumstances change, as they do a lot these days, they won’t have the adaptability to succeed. Being able to handle higher levels of abstraction, then, gives you more leverage and more flexibility. In today’s environment where we have to deal with increasing amounts of complex, uncertain, ambiguous information, the ability to chunk up to higher levels of abstraction is increasingly valuable. Other things being equal, and as long as you also have what we can call emotional intelligence or people skills, that ability will get you promoted faster and more highly rewarded. One of my teachers, Tad James, tells a story about how he was making this point on an NLP course and a student at the back stuck his hand up and said “Hang on a minute – I’m a philosophy postgrad at the university, I deal in very high level abstractions all day long, and I get paid an absolute pittance!” And Tad pointed out that what actually gets you promoted or rewarded highly is the ability not just to operate at the big picture or strategic level, but also having the flexibility to be able to move down to more specific levels and communicate what that means in practice to people who are operating at those levels. So flexibility, and getting comfortable with chunking up, down, or sideways as needed, is the key. 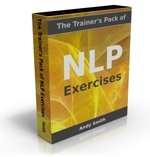 A good live NLP Practitioner training will generally include some practical exercises to develop that flexibility.